Ulugh Beg (Turkish for “great prince”) was governor of Transoxiana and Turkestan and, during the last 2 years of his life, Timurid Sultan. However, he is mostly remembered as a patron of mathematics and astronomy. In Samarqand, he founded a school and the famous astronomical observatory, where the most extensive observations of planets and fixed stars at any Islamic observatory were made. Ulugh Beg is associated with a Persian astronomical handbook (zīj) that stands out for the accuracy with which its tables were computed. Ulugh Beg was the first‐born son of Shāhrukh (youngest son of the infamous conqueror Tīmūr or Tamerlane) and his first wife Gawharshād. He was raised at the court of his grandfather and, at the age of 10, was married to his cousin Agha Bīkī, whose mother was a direct descendent of Chingiz Khan. Thus Ulugh Beg could use the epithet Gūrgān, “royal son‐in‐law,” which had originally been used for Chingiz’s son‐in‐law. In the years after Tīmūr’s death in 1405, Ulugh Beg became governor of Turkestan and Transoxiana, the most important cities of which were the cultural centers Samarqand and Bukhara. Although not completely divorced from affairs of state, he is better known for his interest in religion, architecture, arts, and sciences, which were fostered by the Mongols as well as by the Timurids. Ulugh Beg is said to have spoken Arabic, Persian, Turkish, Mongolian, and some Chinese. He had a thorough knowledge of Arabic syntax and also wrote poetry. Although he honored Turkic–Mongolian customs, he also knew the Quran by heart, including commentaries and citations. Ulugh Beg was also a passionate hunter. By 1411, Ulugh Beg had developed a lively interest in mathematics and astronomy, which may have been aroused by a visit in his childhood to the remnants of the Marāgha Observatory that had been directed by Ṭūsī. In 1417, he founded in Samarqand a madrasa (religious school or college) that can still be seen on the Registan Square. At this institution, unlike other madrasas, mathematics and astronomy were among the most important subjects taught. The most prominent teacher was Qāḍīzāde al‐Rūmī, who was joined somewhat later by Kāshī. Two extant letters by Kāshī to his father in Kāshān make clear that Ulugh Beg was personally involved in the appointment of scholars and that he was frequently present, and actively participated, in seminars, where he displayed a good knowledge of mathematical and astronomical topics. Kāshī relates how Ulugh Beg performed complicated astronomical calculations while riding on horseback. Anecdotes from other sources show that Ulugh Beg, like many other Muslim rulers, believed in astrology and fortune‐telling. He appears as a person who very much respected the scholars he appointed, and whose main objective was to reach scientific truth. In 1420, Ulugh Beg founded his famous astronomical observatory on a rocky hill outside the city of Samarqand. Its circular main building, beautifully decorated with glazed tiles and marble plates, had a diameter of about 46 m and three stories reaching a height of approximately 30 m above ground level. The north–south axis of the main building was occupied by a huge sextant with a radius of 40 m (called Fakhrī sextant after that of Khujandī). On the scale of this instrument, which partially lay in an underground slit with a width of half a meter, 70 cm corresponded to 1° of arc, so that the solar position could be read off with a precision of 5″. On the flat roof of the main building various smaller instruments could be placed, such as an armillary sphere, a parallactic ruler, and a triquetrum. Among other instruments known to have been used in Samarqand are astrolabes, quadrants, and sine and versed sine instruments. Although Ulugh Beg was the director of the Samarqand Observatory, Kāshī was in charge of observations until his death in 1429, after which he was succeeded by Qāḍīzāde, who died after 1440. The observational program was completed by Qūshjī, who had studied in Kirmān (southeastern Iran) before returning to Samarqand. The results of the observations made under Ulugh Beg include the measurement of the obliquity of the ecliptic as 23° 30’17” (the actual value at the time was 23° 30’48”) and that of the latitude of Samarqand as 39° 37’33” N. (modern value: 39° 40′). Furthermore, most of the planetary eccentricities and epicyclic radii were newly determined, and the longitudes and latitudes of the more than 1,000 stars in Ptolemy’s star catalogue were verified and corrected. Precession was found to amount to 51.4″ per year (corresponding to 1° in little more than 70 years; the actual value is 50.2″ per year). The observatory of Ulugh Beg stayed in operation for little more than 30 years. It was finally destroyed in the 16th century and completely covered by earth in the course of time. In 1908, archaeologist V. L. Vyatkin recovered the underground part of the Fakhrī sextant, consisting of two parallel walls faced with marble and the section of the scale between 80° and 57° of solar altitude. Ulugh Beg’s observatory exerted a large influence on the huge masonry instruments built by Jai Singh in five Indian cities (most importantly Jaipur and Delhi) in the 18th century, more than 100 years after the invention of the telescope. The main work with which Ulugh Beg is associated is an astronomical handbook with tables in Persian, variously called Zīj‐i Ulugh Beg, Zīj‐i Jadīd‐i Sulṭānī, or Zīj‐i Gūrgānī. In the introduction, Ulugh Beg acknowledges the collaboration of Qāḍīzāde, Kāshī, and Qūshjī, who were undoubtedly responsible for the underlying observations as well as the computation of the tables. The Zīj is in many respects a standard Ptolemaic work without any adjustments to the planetary models. It consists of four chapters dealing with chronology, trigonometry and spherical astronomy, planetary positions, and astrology, respectively. The instructions for the use of the tables, which were edited and translated into French by L. Sédillot in the middle of the 19th century, are clear but very brief and do not even include examples of the various calculations. Ulugh Beg’s Zīj was highly influential and continued to be used in the Islamic world until the 19th century. It was soon translated into Arabic by Yaḥyā ibn ʿAlī al‐Rifāʿī and into Turkish by ʿAbd al‐Raḥmān ʿUthmān. Reworkings for various localities were made in Persian, Arabic, and Hebrew by scholars such as ʿImād al‐Dīn ibn Jamāl al‐Bukhārī (Bukhara), Ibn Abī al‐Fatḥ al‐Ṣūfī (Cairo), Mullā Chānd ibn Bahāʾ al‐Dīn and Farīd al‐Dīn al‐Dihlawī (both Delhi), and Sanjaq Dār and Husayn Qusʿa (Tunis). Commentaries to the Zīj were written by Qūshjī, Mīram Chelebī, Bīrjandī, and many others. Hundreds of manuscript copies of the Persian original of Ulugh Beg’s Zīj are extant in libraries all over the world. Already in 17th‐century England, various parts of the Zīj were published in edition and/or translation. Little is known about other works of Ulugh Beg. A marginal note by him in the India Office manuscript of Kāshī’s Khāqānī Zīj presents a clever improvement of a spherical astronomical calculation. A Risāla fī istikhrāj jayb daraja wāḥida (Treatise on the extraction of the sine of 1°) has been attributed to Ulugh Beg on the basis of a citation in Bīrjandī, although most manuscripts of this work mention Qāḍīzāde as the author. Aligarh Muslim University Library lists a treatise Risāla‐yi Ulugh Beg that is yet to be inspected. Finally, an astrolabe now preserved in Copenhagen and made in 1426/1427 by Muḥammad ibn Jaʿfar al‐Kirmānī, who is known to have worked at the observatory in Samarqand, was originally dedicated to Ulugh Beg. In 1447, Ulugh Beg succeeded his father Shāhrukh as sultan of the Timurid empire. However, he was killed on the order of his son ʿAbd al‐Laṭīf. An investigation of Tīmūr’s mausoleum by Soviet scholars in the 1940s showed that Ulugh Beg was buried as a martyr in accordance with Sharīʿa (Islamic law), i. e., fully clothed in a sarcophagus. By Benno van Dalen, Ulugh Beg: Muḥammad Ṭaraghāy ibn Shāhrukh ibn Tīmūr, The Biographical Encyclopedia of Astronomers, pp 1157-1159. Bagheri, Mohammad (1997). “A Newly Found Letter of Al‐Kāshī on Scientific Life in Samarkand.” Historia Mathematica 24: 241–256. Barthold, V. V. (1958). Four Studies on the History of Central Asia. Vol. 2, Ulugh‐Beg. Leiden: E. J. Brill. ——— (1976). “Ulugh Beg.” In Dictionary of Scientific Biography, edited by Charles Coulston Gillispie. Vol. 13, pp. 535–537. New York: Charles Scribner’s Sons. Knobel, Edward Ball (1917). Ulugh Beg’s Catalogue of Stars: Revised from All Persian Manuscripts Existing in Great Britain, with a Vocabulary of Persian and Arabic Words. Washington: Carnegie Institution of Washington. ——— (1993). “A More Complete Analysis of the Errors in Ulugh Beg’s Star Catalogue.” Journal for the History of Astronomy 24: 269–280. Kunitzsch, Paul (1998). “The Astronomer al‐Ṣūfī as a Source for Uluġ Beg’s Star Catalogue.” In La science dans le monde iranien ā l’époque islamique, edited by Ž. Vesel, H. Beikbaghban, and B. Thierry de Crussol des Epesse, pp. 41–47. Tehran: Institut français de recherche en Iran. Manz, Beatrice F. (2000). “Ulugh Beg.” In Encyclopaedia of Islam. 2nd ed. Vol. 10, pp. 812–814. Leiden: E. J. Brill. Rosenfeld, B. A. and Jan P. Hogendijk (2002/2003). “A Mathematical Treatise Written in the Samarqand Observatory of Ulugh Beg.” Zeitschrift für Geschichte der Arabisch‐Islamischen Wissenschaften 15: 25–65. Sayılı, Aydın (1960). The Observatory in Islam. Ankara: Turkish Historical Society, esp. pp. 260–289. ———(1960). Ghiyâth al‐Dîn al Kâshî’s Letter on Ulugh Beg and the Scientific Activity in Samarqand. Ankara: Turkish Historical Society. Sédillot, Louis P. E. Amélie (1847). Prolégomènes des tables astronomiques d’Oloug‐Beg. Publiés avec notes et variantes et précédés d’une introduction. Paris: Firmin Didot. ——— (1853). Prolégomènes des tables astronomiques d’Oloug‐Beg. Traduction et commentaire. Paris: Firmin Didot. Shevchenko, Mikhail Yu (1990). “An Analysis of Errors in the Star Catalogues of Ptolemy and Ulugh Beg.” Journal for the History of Astronomy 21: 187–201. 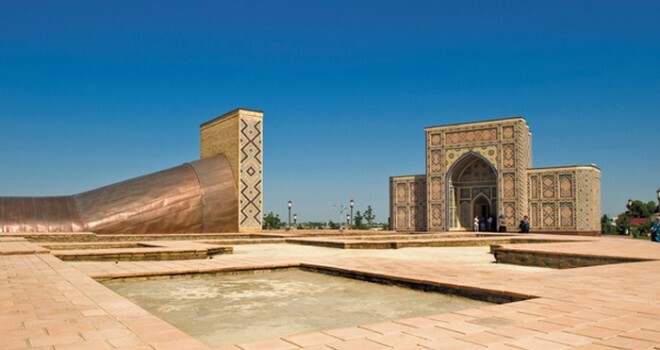 The Ulugh Beg Observatory in Samarqand, Uzbekistan, completed in the fifteenth century, was used by several famous Islamic astronomers.